Lets make refinements great again! The new release is out and it contains 2 major and long anticipated improvements like the JQL bookmarks and Jira Server as well as some minor bug fixes. The Jira Server is finally approved and available for installation on your Jira Server instances The marketplace link is here. When installed, the add-on behaves like the well known Jira Cloud add-on. There is still no Confluence integration with automatic summary generation though. Finally, we introduced a great improvement on the way how JQL queries are maintained (same for GitHub and GitLab queries). The drop-down box for the queries now shows the recent queries, the bookmarked most-often used queries and example queries which can be used as a starting point. Note that the bookmarked queries are excluded from the recent queries to save space in the drop-down box. The Gravatar sign in now works again. It works by first entering the e-mail address of the profile, then the avatar appears on the right side of the e-mail box and then when pressing this button with tooltip “Sign in as <your user>”, the Gravatar profile is used. Sometimes after installing the Scrumpy Planning Poker as a mobile application, starting it leads to infinite loop. Now the most recent room is open and the application starts immediately. Navigating to a room with the local storage (cookies, etc.) disabled caused by add-blockers, anonymizing tools, etc. lead to inability to enter the room. Now Scrumpy can be used with those tools. All those nice features (and fixed bugs) have been completed thanks to our users – they have requested and we have implemented them. 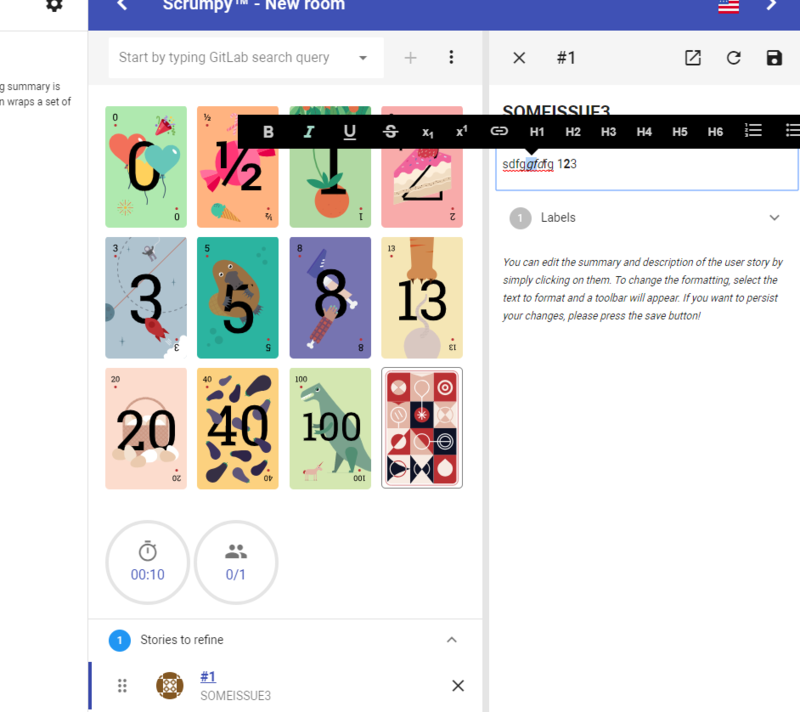 Please help Scrumpy Planning Poker become even more convenient for you by submitting a feature request/bug to our Feature Requests page or up-vote an existing feature that you find useful. Thank you! In this release there are quite some major improvements. A lot of work has been done to improve the performance and add support for new platform integrations. 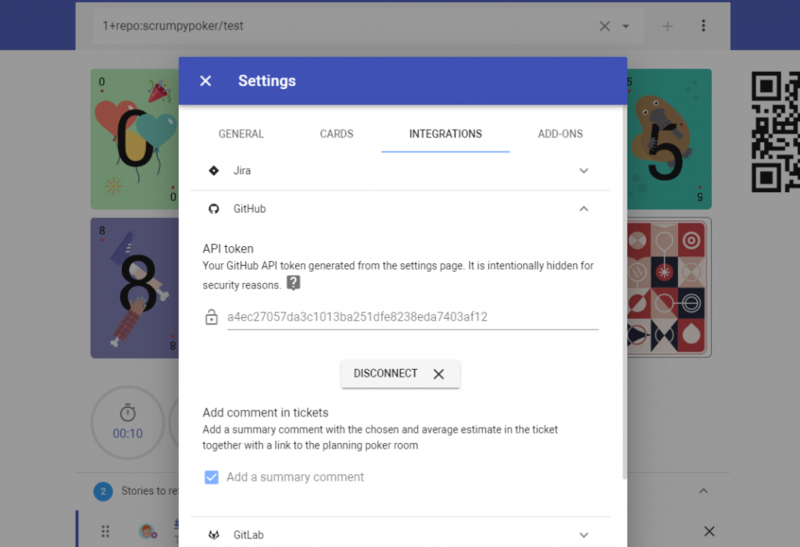 The quite big set of new features include GitHub, GitLab, Confluence summary improvements and complete refactoring of the code to allow great performance in the browser. Now it is possible to integrate with GitHub directly and using GitHub queries it is easy to list and add stories for estimation. Both issues from free public repositories as well as private repositories can be estimated. After signed in, others will see your GitHub profile, but access to issues is still not set up. To complete the configuration, go to the Settings page and set the GitHub access token that was previously created. To create a personal access token for access with GitHub, go to your settings page and choose Personal Access Tokens. As in the Jira Cloud integration, there is an option to add comments to issues that are being estimated. The comment includes a link to the poker room as well as the result of the estimate. To find the issues that will be estimated and add them to the list of planned story, as usual, search for the issues in the query box. The queries supported are GitHub queries which can be used to find any issue in both public and private projects. For example, to list only issues in a particular project, use the repo: prefix, for example repo:scrumpypoker/test. 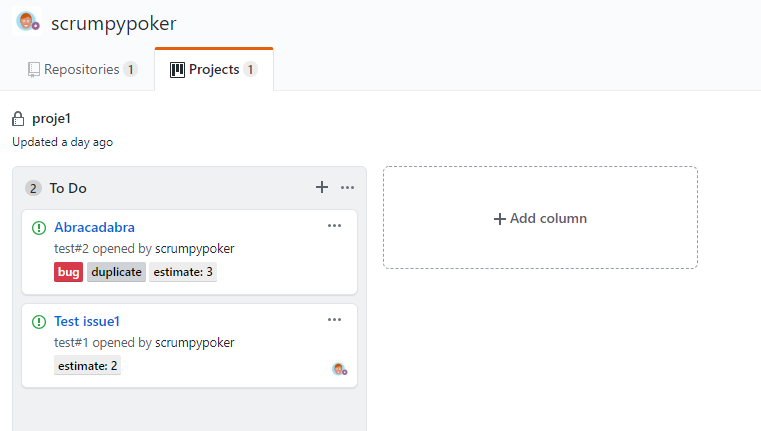 You can list stories assigned to a user, created by a user or just do a free-text search for example Abracadabra+repo:scrumpypoker/test will search for all issues that have Abracadabra in the summary or description and belong to the scrumpypoker/test project. More information about the GitHub queries can be found in the GitHub Search documentation. The collaboration editor is integrated with GitHub so you can edit in-place the GitHub summary, description and labels as in the Jira add-on. Since there is no field that is designated to story points in GitHub, this is done using labels. The label estimate:<points> is used to mark the estimate of a story. Any previous estimate is removed prior to assigning a new estimate. Now it is possible to integrate with GitLab directly and using GitLab project-based free-text search, it is easy to list and add stories for estimation. Both issues from free public repositories as well as private repositories can be estimated. After signed in, others will see your GitLab profile, but access to issues is still not set up. To complete the configuration, go to the Settings page and set the GitLab access token that was previously created. Except the personal access token, the GitLab integration needs also a root project that will be bound to this planning poker room. All queries for issues from now on will be for this project only. This is a bit different from the GitHub integration due to the GitLab specifics. Note: you cannot start estimating stories until both the token and the project is selected. 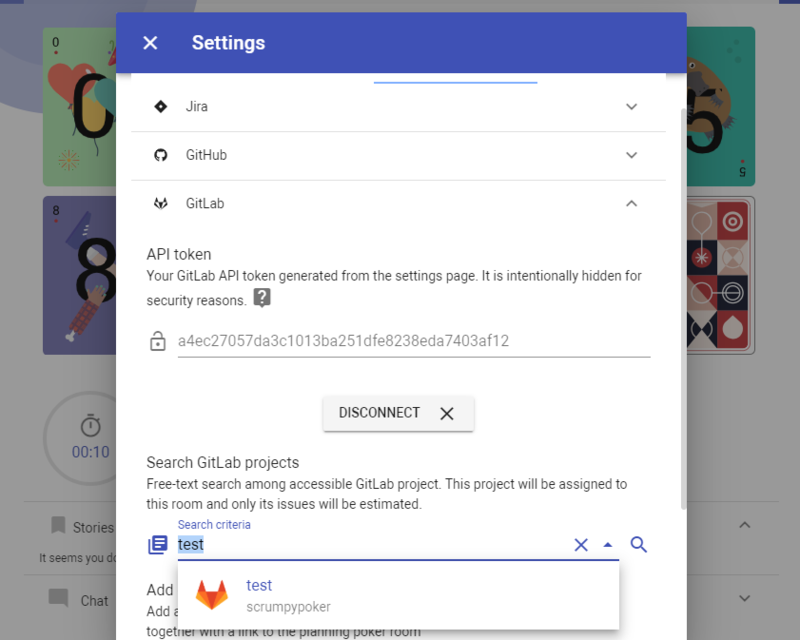 You can generate a personal access token from the GitLab settings page. Just make sure you give it API scope. Issues can be listed from the search query using free text and wildcard matching as described in the GitLab search documentation. For example, exception free text pattern matching, you can use #1 for for issue number 1, #2453 for issue with IID 2453, etc. The collaboration editor is integrated with GitLab and the currently focused issues can be edited as usual. Additionally, comments can be viewed (only the ones added by real people, e.g. excluding the system comments) and labels can be edited. As in GitHub, story estimation happens in the labels. When a story is estimated, a label is created with the value estimate:<points>. When the story is estimated again, the old estimate is removed and the new one is added. Now there is an easy shortcut to generate a Confluence summary page after the refinement session is over. Previously, this was done automatically. From now on, this option is available only for manual trigger. 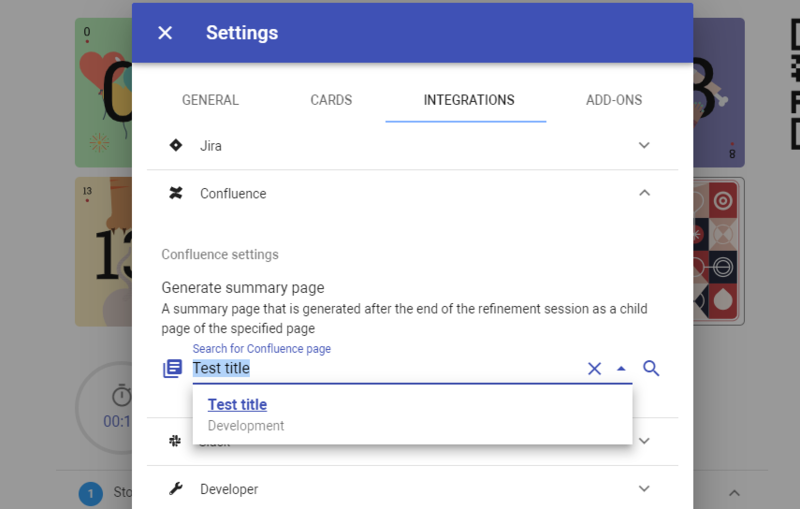 The generation can be triggered from the … context menu of the refinement session when the root Confluence Page that will hold the reports has been assigned from the Settings page. Together with the features, several bugs have been fixed. Due to Twitter requesting extra information and Google migrating away from Google Plus, those two social login buttons did not work. Now they are back in order. Sometimes, creating a new room required you to manually refresh the page to see the cards. Now this is no longer required and the room is open as soon as it is created after pressing the Poker Now button. Planning poker, also called Scrum poker, is a consensus-based, gamified technique for estimating, mostly used to estimate effort or relative size of development goals in software development. 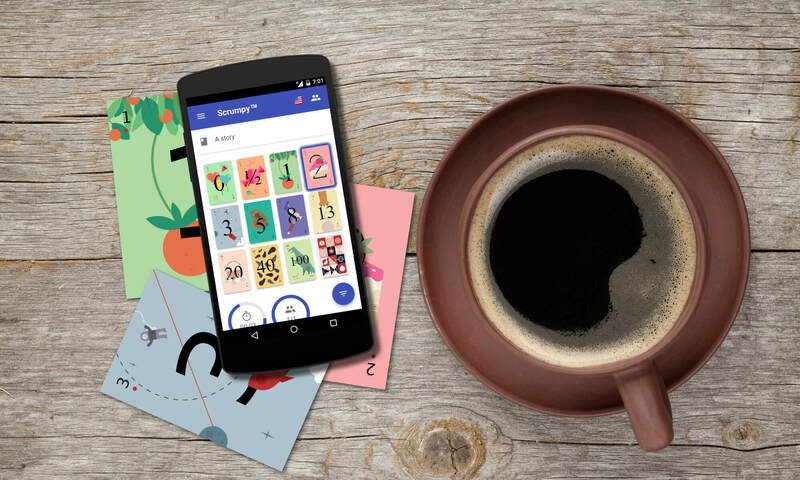 In planning poker, members of the group make estimates by playing numbered cards face-down to the table, instead of speaking them aloud. The cards are revealed, and the estimates are then discussed. By hiding the figures in this way, the group can avoid the cognitive bias of anchoring, where the first number spoken aloud sets a precedent for subsequent estimates.